Monday Night Hockey at the South Windsor Recreational Complex begins April 8th (subject to change) and will be completed mid to late August 2019. Season 36 upcoming consists of 2 games per night for 12 weeks (including playoffs). Games each week are scheduled to begin at 8:30 pm and continue until 10:30 pm, each game consists of 22 minutes. All City of Windsor facilities only permits the use of an approved floor hockey stick with plastic blade, the stick must be free of black/dark tape at this facility, Equipment suggestions include: gloves, shin pads and jock. Please email us at bordercityballhockey@gmail.com prior to payment to see about availability as there is limited space and if roster spots are taken your payment will be refunded and subject to delay. Is a Round Robin 3 Week Tournament Monday Night's at the Oakwood Community Centre which begins December 5th, 2016. The upcoming Round Robin Tournament consists of 2 games per night for 3 weeks (including playoffs). Games each week are scheduled to begin at 8:00 pm and continue until 10:30 pm, each game consists of 22 minutes. As part of your registration each player receives an invitation to our draft night party as well as the opportunity to win awards. Teams are drafted prior to the start of the tournament and are made with every effort to keep teams balanced. Teams are looked over by a board consisting of 7 current league players who also volunteer their time to referee and score keep games on a weekly basis. 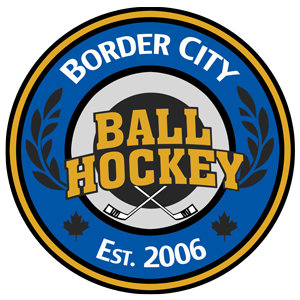 Like other participatory sporting events/leagues, Border City Ball Hockey operates under a strict no – refund policy. The reason for this policy is that as soon as a player registers, organizers make commitments based on registration (t-shirts, rentals, awards) as a result refunds will not be granted once a player has been registered.